I saw a photo that was being shared on Facebook the other day that said, “Lord, empty me of me, so I can be filled with you.” This is based on John the Baptist’s words, “He must increase, but I must decrease.” Sounds great, doesn’t it? Too bad it’s not Biblical. Yes, I know, saying that the statement above is not Biblical is rather inflammatory. But I’m about to prove it to you from the heart and Word of God, and I think you’re going to like it. The new perspective is going to rock your world and draw you closer to your Heavenly Father than ever before. Are you ready? 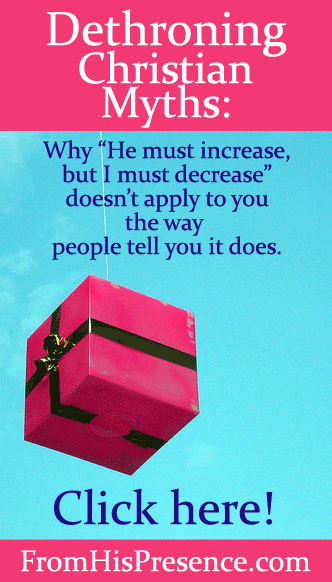 The phrase “He must increase, but I must decrease” comes from John 3:27-36. In this passage, John the Baptist is talking with his own disciples and some Jews about the Law. They had been arguing about ritual purification, and they came to John to settle their argument. John took the opportunity to explain to them that things were changing. He explained that he (John) was not the Christ, but that Jesus had arrived from Heaven. He talked of the new day that was upon them; about the transition from the Law to the Kingdom. John was the last prophet under the Law. But Jesus ushered in the Kingdom, which is based on true relationship with God by grace. So when John said “He must increase, but I must decrease,” he was talking about the fact that the Law was being fulfilled, and the new day of the Jesus’ Kingdom was dawning. But Christians have taken these seven words and turned them into a mantra with a completely different meaning. And we say that with the best intentions, and God knows our hearts when we do. But the problem is that it has never been God’s dream to kill you. This “new creation” is a totally new creature; something that has never existed before. In Christ, you have become a new man. And now, as a new creation in Christ Jesus, you have sanctified goals, dreams, and desires. You have spiritual gifts, a personality, and talents… all of which the Lord has given you on purpose. Isaiah 29:16 says, “For shall the thing made say of him who made it, “He did not make me”? Or shall the thing formed say of him who formed it, “He has no understanding”? Yet that’s completely what we are saying to God when we tell Him to empty us of ourselves so that we can be filled with Him. O Christian–new man in Christ that you are–I have good news for you today: It’s not God’s dream to undo His work in you. It’s not God’s dream to kill you. God’s dream is to have all of Him in all of you. That’s the Kingdom perspective. God redeemed you to Himself so that you could walk in relationship with Him, manifesting His glory on the earth (Romans 3:23). He filled you completely with His Holy Spirit. Now, as His child, you are a representation of Him. In order to represent Him to the world, you’re going to need your gifts, dreams, and desires. God gave you those gifts on purpose, and He knew what He was doing. That is the truth of the Kingdom. Tomorrow, I will post more on this topic, including the how and why you are God’s dream. But for now, would you just thank God for the gifts and dreams He has given you, and ask Him to fill all of you with all of Him? Image courtesy of Procsilas Moscas on Flickr via Creative Commons license. I completely see what John the Baptist truly meant, and I’ve taken it that way. However, I know that many people do not take it to mean that they must disappear completely… some take it (incorrectly, I realize that) to mean that their will, their wants, their desires, their perceptions, need to be conformed into Christ’s, that their lives should revolve far more around Jesus’ Will than their own. Hi, Leslie. Thanks for reading! I agree that we should be conformed to Christ in every way. But since He is the Author of all creativity, and the Creator of all things, we can each function fully in our giftings and be very different from one another, yet still be conformed to Christ. The mindset I was going after here was the mindset that says “I’m no good, Jesus, so I need You to make me really small so nobody can see what You made.” Many people do think that way, but that is not a Biblical attitude at all. God didn’t make junk when He made any of us. Each of us is precious and unique and beautiful and worth dying for, in His opinion. So we simply need to let all of Him flow through all of us, and we won’t have to worry about stealing any of His glory. He’ll get it all, and He’ll be able to use us as His hands and feet to demonstrate His power on the earth–in the unique way He made each of us to carry it! Thanks again for reading, and for commenting! I confess, I read it that way. I thought I needed to let go of something. Praying is the spirit is important. The Holy Spirit helps you understand the Bible. And I have learned a great deal from Joseph Prince, I agree that people are being disqualified, from God’s blessings. You’re right that that phrase is about John the Baptist’s specific call, not a call for Christians. But John’s call is not unlike the call for all Christians to die to self, give up selfish desires, and take our focus off ourselves and place it on others and God, living for Christ, not for ourselves, not being confident in our abilities but confident in Christ’s power and strength within us. And so, dear brothers and sisters, I plead with you to give your bodies to God because of all he has done for you. Let them be a living and holy sacrifice—the kind he will find acceptable. This is truly the way to worship him. 2 Don’t copy the behavior and customs of this world, but let God transform you into a new person by changing the way you think. Then you will learn to know God’s will for you, which is good and pleasing and perfect. 3 Because of the privilege and authority God has given me, I give each of you this warning: Don’t think you are better than you really are. Be honest in your evaluation of yourselves, measuring yourselves by the faith God has given us. As you say, God doesn’t want to undo His work in us, but neither did He want to undo His work in John The Baptist, so I don’t see a problem with Christians using this phrase to mean they want their lives to be less of self and more of God. I’ve never heard anyone use it to mean that they should get rid of their God-given talents – but I’ve heard many use it to say they should give those God-given talents to God’s purposes and not their own. Thanks for letting me share my view. Hi Gail. Thanks for reading my blog! That point is simply that Father made each of us to fill a very specific role in His Body. And unless we step up to put our hands to the plow as everything He made us to be, a gap exists in His Body that cannot be filled by anyone else. So both are true: we must completely die to self and live for Christ and Christ alone–but we also must acknowledge that He didn’t make a mistake when He created us, and He needs us to be everything He made us to be, bright and shining for the world. I think you have been brainwashed by Bill Johnson. Your view is way too triumphalist if and leads to arrogant believers. John the Baptist is simply saying my work if preparation is now getting less so Jesus work can begin. No brainwashing here. Actually, if you read the Scriptures, there is no room for anything BUT triumph in Christ Jesus. Thanks for reading and for sharing your thoughts. Blessings to you. Interesting…especially since I have never once read or heard of that passage being couched n the manner of your response…and I have been in the Church my entire life, being the son of a Pastor.